In the last part we got to the point where RISC-V code, built with GCC, could run and display text over HDMI and blink LEDs. However, this could only run from the 192KB of Block RAM we initialized within the Spartan7 FPGA on our Digilent Arty S7-50 board. Whilst 192KB is a nice amount of on-FPGA fast storage, we have a 256Mbyte DDR3 chip sitting next to the FPGA which is crying out for use. 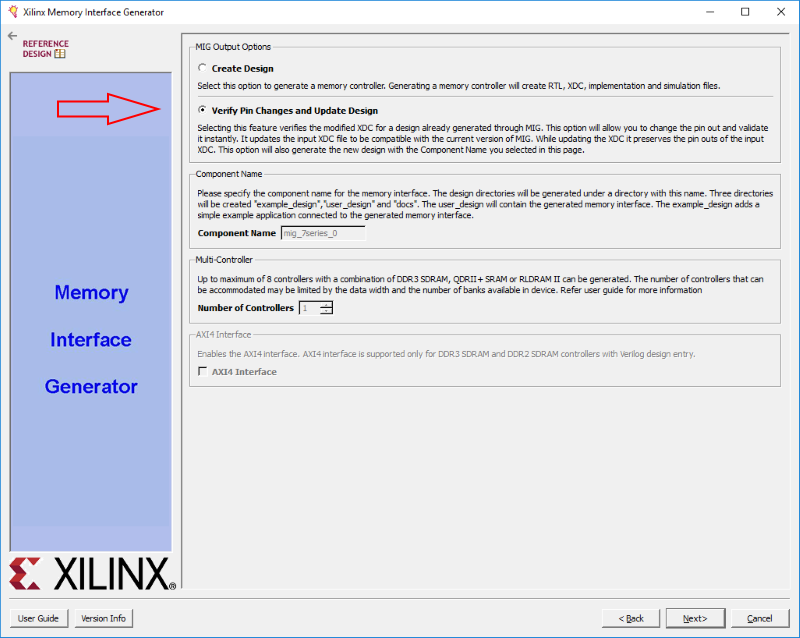 This post follows on from part 16 and integrates a DDR3 memory controller provided by Xilinx, and using an SD card Pmod adapter, load code from the SD card into that memory for use. The DDR3 memory chip on the ArtyS7 seems to vary from board to board, but the timing specifications should be compatible for all. For clarity, the chip on my development board is a PMF511816EBR-KADN. It connects with address and data signals direct to the FPGA. 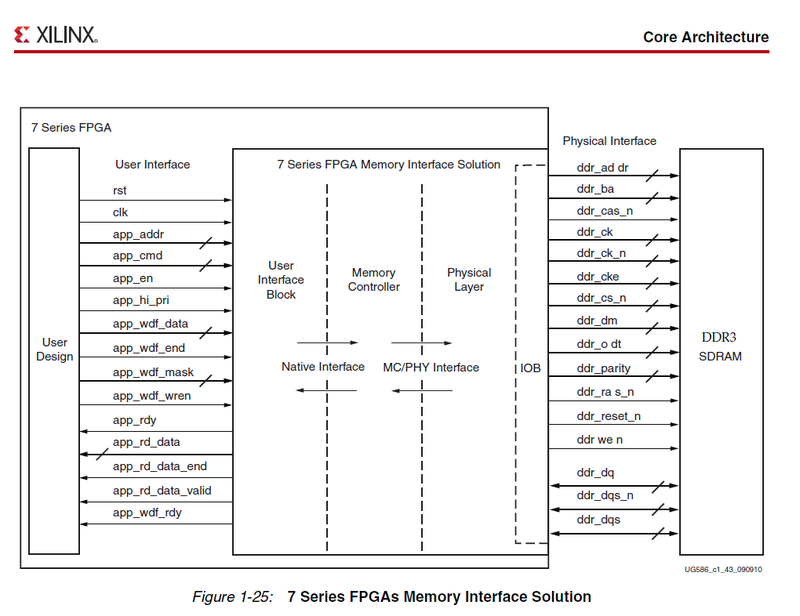 There are many other control signals, but we are not going to get into how DDR3 memory works in this post, as Xilinx Vivado comes with a wizard for generating memory interfaces. The Memory Interface Generator (MIG) seems to be an older utility and I had a few problems with it. However, in the end, I did get a working interface generated. Digilents documentation for the ArtyS7 board includes various files for importing into MIG to assist with generation of the memory interface. 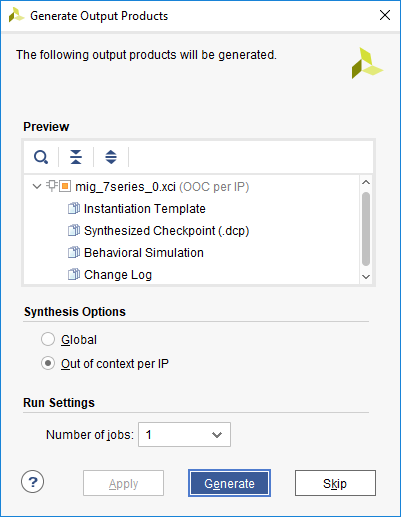 In MIG itself, you will not see an option for importing settings explicitly – you need to select that you are verifying an existing design. Before the following section walking through the wizard, ensure your Vivado project is located in a local drive – I generally worked on a mapped network drive, and the build will fail to implement the controller at synthesis time if the project is on a network drive. Another item to note – you must go through the IP Catalog. When I tried to I initiate the MIG through the Block Design view that I used for generating BRAM in the previous article, VHDL solutions could not be generated. We go through the wizard, using the Digilent files to configure the memory controller. Generally it is a case of hitting next though each screen, except from a few pages at the start where you need to input the file paths, and validate the pins – but the validation should succeed with a few warnings. The next screen was quite something, with the wizard saying the browse buttons for file paths were not supported on Windows 10. Validating the pins above will only generate a few warnings. Click next through the rest of the wizard and generate the design. When the implementation of the memory controller has completed, which took minutes on a Ryzen 2700X+SSD, we can see it in the IP pane. 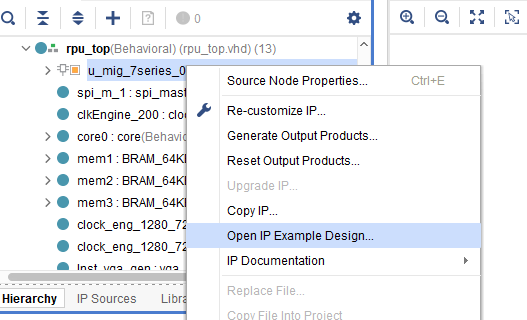 At this point, you can open an example project by right clicking the IP in the hierarchy. The example project can run in the simulator very slowly (initialization took many seconds in the waveform before real simulation begins). You can see the VHDL component definition to use for the controller, and I copied that into the RPU project. The generated design uses the User Interface(UI) implementation to the memory controller, which preserves things like request ordering. 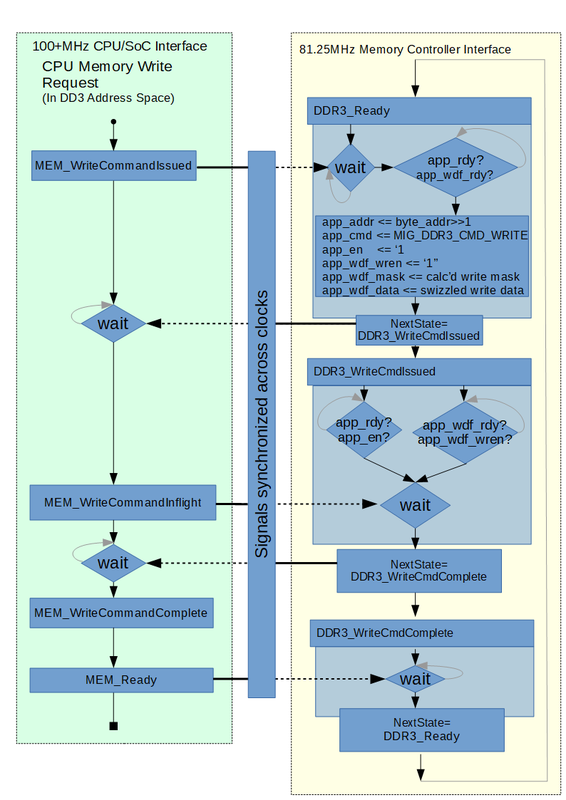 There is a Xilinx document UG586 which details the signals used in this interface, including example waveforms for various read and write request states. The UI used to utilize the memory controller is good for the use cases that I want: request ordering is preserved, burst reads/writes, writes with byte enable. I originally wanted to use the Native interface – which you can read about in document UG586 if you want to know more – but what I wanted was very basic. The native interface is significantly more involved to use as things like out of order request completion can occur. 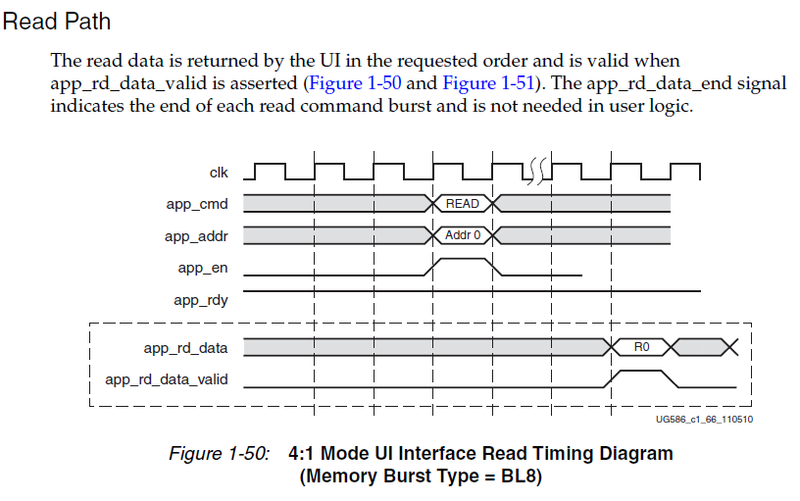 In addition to the main data and control busses you’d expect, there are a few other signals which need connected in VHDL for the memory controller to operate. On ArtyS7, we need to feed it both 100 and 200MHz clocks. Additionally, we need to ensure the controller is not used after a reset until the initialization complete signal is asserted from the memory controller internals. One other major item of importance – the controller must be driven off of a ¼ memory interface clock, which for us is 81.25MHz. This is a good bit down on our current 200MHz CPU clock, but for now I just ran everything at this clock frequency, which is provided by the controller itself as an output. 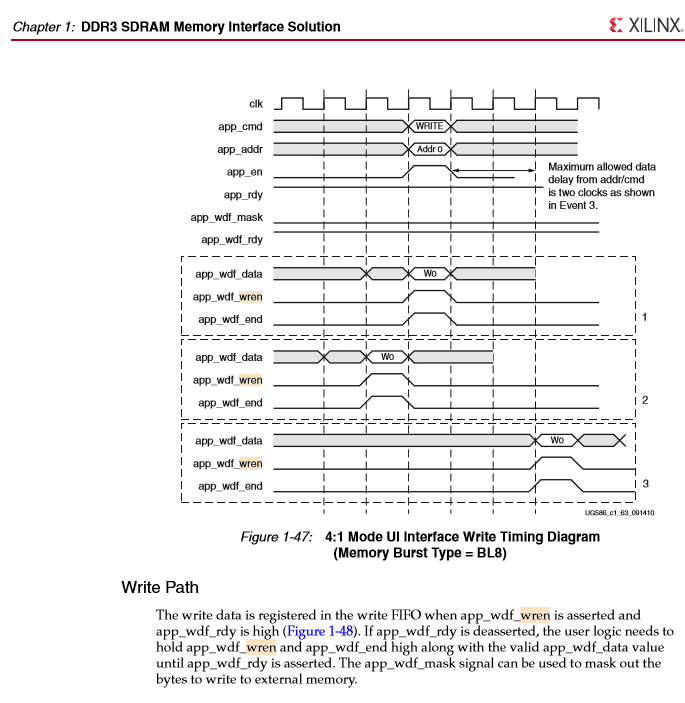 The documentation from Xilinx shows how read and write transactions operate. The interface to the controller supports multiple back to back reads and writes for highest performance, but we only want basic single requests. 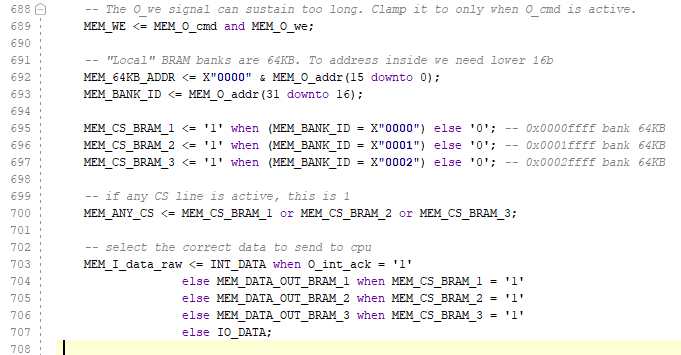 We can implement these easily in our VHDL using the already existing MEM_proc memory request process. We will just add some new states to implement the various stages of a new state machine, and we should be good. The writes can be implemented in one of three ways, as explained in the above waveform diagrams. We are using method 1, asserting the *wdf signals for the write command data at the same time as the initiation of the commands using app_cmd. As briefly mentioned earlier, we need to handle resetting of the memory controller. We activate the reset signals for the memory controller and CPU core for the same length of time. This is implemented with a decreasing 100MHz counter, initialized to some value in the thousands, with the resets being deactivated at 0. The DDR3 physical interface always initiates a calibration sequence after reset. When this operation is complete, a controller output signal is asserted which we should check for before sending memory requests. I managed to find patterns for all the different read modes we needed, and the naturally aligned addresses for 4, 2 and 1 byte reads and writes. For writes, I used some lookup tables to assist with generating the byte enable signal – the 128bit write data input was byte masked, so that writing values which are not 128 buts in length do not appear to require a read-modify-write operation. As it stands, I have still not found out why the read operations result in odd looking data from the controller. All things considered, it’s likely I have made an error early on in the implementation of the data swizzling for writes using the controller, which then dominos into the read operations. It’s something I’ll be returning to. This is fine for us just now, but I was intending on using the burst data to fill caches in later work on the CPU, and for that to work efficiently we will need to fully understand how this burst data organization works. So. 256MB of ram unlocked, and passing fairly basic read/write tests. But the latency is very slow! Much slower than expected. I added some counters to the read state machine, and it seems to take around 22 cycles for a read. At 82MHz this is a long time. However, when searching online, it seems others have also seen this kind of latency, so I did not look into it – and instead tried to decouple the DDR memory clocking from that of the CPU and the rest of the SoC, like block rams. A clock domain can be imagined by separating out all aspects of your design into blocks. For each block which runs off a certain clock, it is on that clocks domain. Generally, blocks which synchronize off the same clock, and therefore are in the same domain, can pass signals between them relatively easily. Currently, we have many clock domains in the SoC, but only 1 in the CPU side of things. The other clock domains are for HDMI output and due to the Block Rams being dual ported with dual clock inputs, we do not need to pass any raw signals across clock domains. For our DDR3 and CPU clocks to be different however, multiple signals would need to cross clock domains. There are numerous issues that can arise when trying to pass synchronized signals across different clock domains. The simplest issue is when trying to read a fast clock signal from a slow clock – and the slow clock completely missing a strobe of the faster signal. There are various methods of crossing signals from one clock to another, with some basic techniques starting with using multiple flip flops to latch signals into other domains. In VHDL, this just looks like a process which reads and latches the value from one signal into another on the destination clock. As we are dealing with single read and write transactions, I decided to cross the CPU to Memory Controller clock domain using state handshaking. We will use two integer signals, which have multiple versions for stability in each clock domain, to implement a state machine process which crosses the clock safely. This can introduce several cycles of additional latency, however at the moment we are trying for a working solution – not a very efficient one. We can give up a few cycles of latency in the CPU clock domain if this means we can run the CPU much faster than the memory controller. The dataflow for a read looks like the following. The way this is implemented is with two processes, one clocked off the Memory Controllers 81.25MHz, the other off the higher CPU clock. The CPU process is actually just the MEM_proc one from before, to make interfacing with the CPUs own memory request logic easier. Each process reads the state of the other using stable signals which are latched into their own clock domain in an attempt to avoid metastability. When both differently clocked processes are in a known state, I read the memory data required across the clock domain. I am not sure this is strictly safe – some say things such as data buses should be passed through a FIFO. It took a few attempts to get this right, mainly due to realising that now I could not run the CPU at previously attainable speeds. It seems that just having the DDR3 controller synthesized into the SoC meant that the CPU core could not get over 166MHz. I have settled on 142.8MHz for now (1GHz/7 – easily attainable from my existing clocking system) as the CPU clock – fast enough for most needs but low enough that any timing issues do not arise. Many additional timing warnings appear on synthesis when the DDR3 controller is included, which was unexpected since this controller was generated by the internal tools. Like I mentioned last part, I do intend to look into these warnings and understand them with an aim of resolving them to unlock higher clocks. For now, 142MHz will do fine – and the additional memory space of DDR3 is very welcome! With the DDR3 memory integrated, I also made quick microSD PMOD adaptor out of a level-shifting microSD adaptor intended for 5v Arduino projects using SPI. The level shifter is not needed for our purposes, as the FPGA already runs on 3.3v logic. No modification of the part was required – just soldering the pins to the 0.1” PMOD headers was enough to work. The SPI port is exposed externally on Pmod JD. The way the SPI port is accessed is the same as discussed in the previous posts – just different memory mapped addresses. I created a new bootloader for the internal BRAM to perform a small memory test (which validates the endian byte swizzling), then initialize SPI and mount an SD card if present. 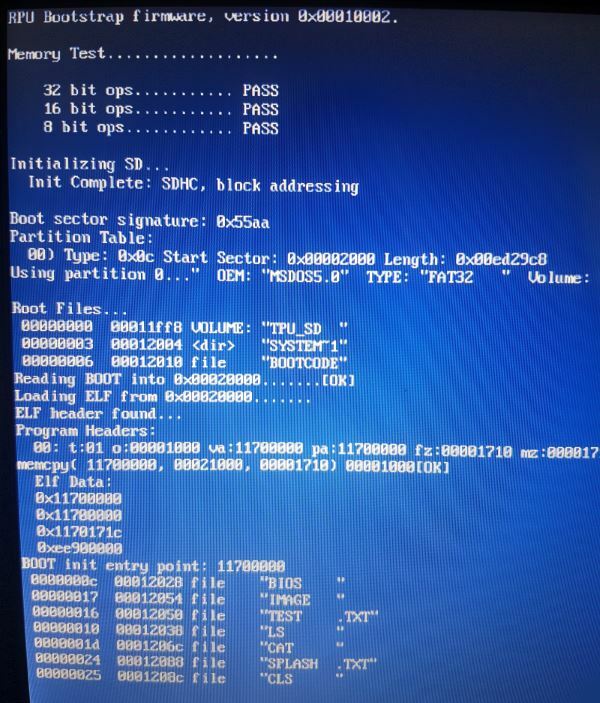 It will examine a BOOT elf file and copy it into the required physical memory location, which can be in DDR3 or BRAM. It will then jump to that elf entry point to continue execution. The DDR3 memory controller takes up the largest amount of resources – not unexpected, they are incredibly complex! I’m quite happy with the current utilization of the RPU core itself. I’ve not been looking into optimization for resources, so having the CPU take up less than 6% of the Spartan S7-50 seems good. Looking at the breakdown of where the utilization of resources comes from, it seems the internal management of memory requests is taking a larger amount of resourced than I’d expect. It will be interesting to see how this changes when the endian swizzle logic is brought into the CPU core, and eventual cache logic added. That bring this part to a close. I am now looking into implementing the required RISC-V Control and Status Registers (CSRs) into RPU. Currently I have memory-mapped data that should be available though CSR instructions. Adding them will be interesting as it will require changes to the CPU interface. Read about that next time! 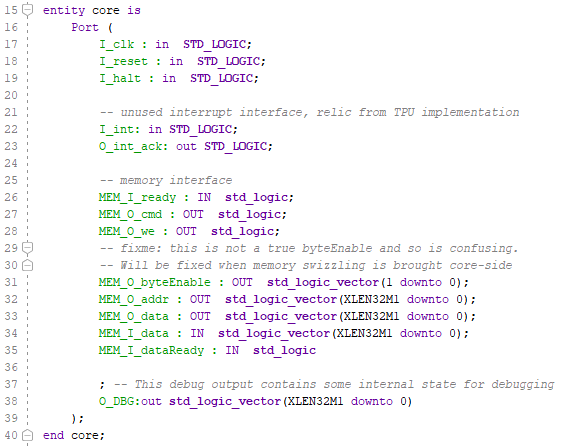 As mentioned last time, the code for the DDR3 controller is already up on github. I still need to check that I’ve implemented the read/write data swizzling to the DDR3 correctly – I’ve a feeling there is a mistake in the writes somewhere, which then impacts the reads. Thanks for reading, and as always, any questions can be directed at myself on twitter @domipheus. It’s finally time – the big deploy onto Digilent’s Arty S7 board. In my previous part, I went over at a high level the changes made to my TPU cpu core in order to make it consume RISC-V. The CPU itself is still very simple, and I removed some of the more interesting features from TPU such as interrupts. Interrupts as implemented on TPU would not comply to the RISC-V spec, so best they were stripped out for the time being. 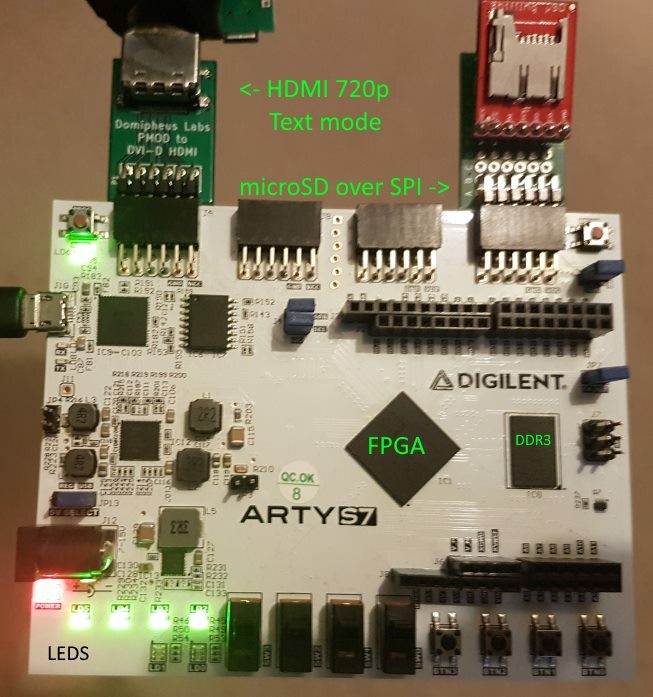 After I got my RISC-V SoC up and running on MiniSpartan6+, I was looking to develop my own Spartan 7 FPGA board to use as a programmable computer kit – FPGA for Soft CPU, another for Soft GPU, a microcontroller for system management – maybe even a 3rd FPGA for chipset I/O. However I quickly came to my senses and realised just how much of an endeavour that is. Spinning my own PCBs, soldering those big BGA chips (and ultimately failing to solder those £40-a-piece chips) would be a very costly affair. It is still a long term goal, but in the meantime I wanted to get an off-the-shelf Spartan 7 FPGA board, essentially to bringup the FPGA side of an eventual move to my own development board. When I saw the Digilent Arty S7 announced last year, I kept an eye on it knowing it would be a contender for my upgrade path to the 7-series chips. The Arty S7 I ended up purchasing is the S7-50 variant, sporting the XC7S50 Spartan 7 FPGA with significantly more resources than my previous Spartan 6 board. It also had 256MB DDR3 RAM, but lacked HDMI connectivity. Thankfully, the HDMI/DVI-D output issue has been solved and you can read about that in a previous article. I’m based in the UK, and was able to purchase the Arty S7-50 from digikey.co.uk for £119 delivered. Checking just now, it looks like the price has increased and you’d now be paying in the region of £125. It’s still a very nice board for that! So, this post is dealing with porting my existing RISC-v “SoC” to this new FPGA board. The SoC consists of my RPU CPU, fast internal FPGA Block RAM storage, external (and slow!) DDR3 memory, my HDMI output with legacy text mode HDMI output, and finally, access to SD card storage via SPI. First, we have to tackle a new development environment. 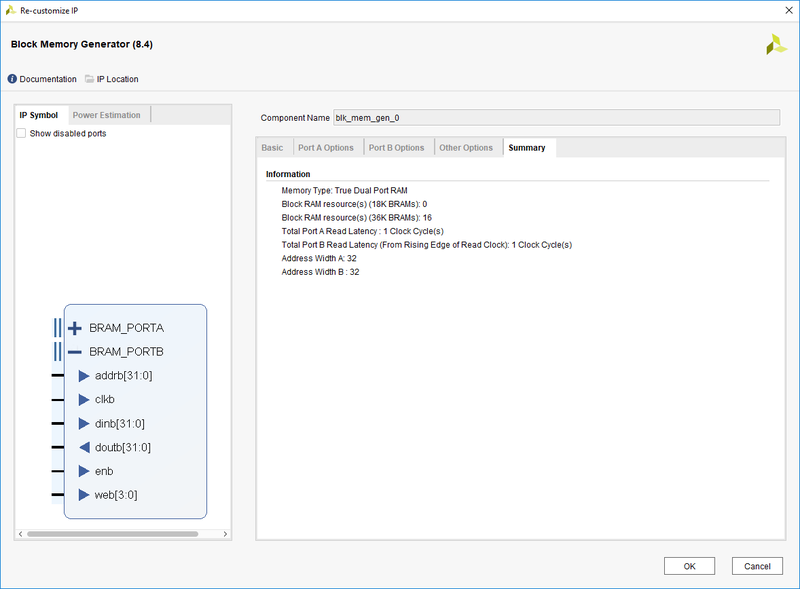 With the new 7-series FPGAs comes a new set of design tools for authoring HDL and deploying to devices. As with ISE, which we used for Spartan 6 FPGAs, Vivado has a free “webpack” edition which is compatible with Arty S7. You can grab the download from Xilinx here. For clarity, I use the 2018.1 version. 2018.2 is the latest version as this is written. The UI has changed quite a bit from ISE. In my opinion, Vivado is harder to navigate and parts of the interface seem very clunky. The general areas of interest remain; a Project Manager “flow” holds the source hierarchy, and the Simulation, Synthesis, and Implementation flows hold the respective details and commands for those aspects of the project. To create projects for the board, we will need the board definition files which are provided by Digilent. There is a small guide on how to download and install them, available here. If you already have Vivado installed, you want to skip to section 3. Digilent also have a demo project available with your usual flashy LED hello world functionality, if you want to start very simple. For the rest of this article however, I’m jumping straight into the project. With our RPU core interface already defined, we need to just import the VHDL source files into our project and begin a new top level design which incorporates the core. As a reminder, the RPU core entity is shown below, and it still heavily resembles the old TPU core. We need to ensure these signals are mapped to the pin constraints of the Arty S7. My board is a Rev. B board, so I made a copy of the respective .xdc file provided with the Digilent board files and exited it to point to my named signals. If you’re familiar with Xilinx ISE, this is like the old .ucf constraints file from my TPU CPU project. An example is below, with LEDs, Clock and the HDMI output defined. With HDMI we need to ensure the signal standard is TMDS_33. This is the definition required to map to my simple HDMI Pmod connectors. The next thing we need to do is figure out some block ram memory. The block ram primitive objects have changed in the Spartan 7 series FPGAs and are larger. Unlike the MiniSpartan6 implementation, where I manually initialized the block rams and added additional switching logic, I am now using the Xilinx IP Block memory generator. This is available in the free Webpack version of vivado and allows for generation of a block ram object of your own data width and memory size. Internally, multiple block ram primitives will be combined into a single interface. I want 64Kbyte block rams, which are made up of 16 smaller 4Kbyte hardware block rams. With a 32 bit data interface, this Block Ram Generator saves us a lot of work. It also allows for a initialization file to be provided, so the block ram can have a defined contents at reset. 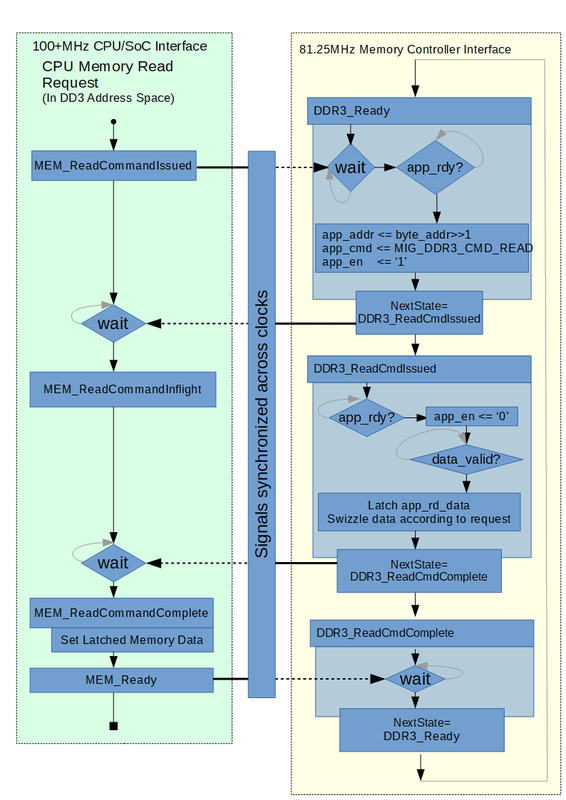 This allows us to have our bootloader present in memory for bootstrapping the SoC. Another option in the block memory generator which we must ensure is unselected is “common clock”. We want our block ram to be a true dual-port ram, with separate clocks for each. This allows the rams to be connected both to the CPU core for read/write, and also another system, such as our HDMI character generator for use as text console storage – running at a pixel clock rate, instead of the CPU clock rate. 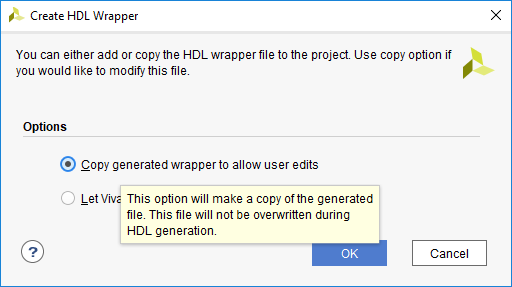 With this, you can create the interface via the GUI and generate an HDL wrapper. I created a wrapper so I could edit the source and ensure the data out ports were tri-stated when the block ram was disabled, for easier plumbing of multiple block rams together. With our block ram wrapper available, we can connect this to memory interface of the RPU core. This is fairly simple, and we can attack multiple block rams by enabling them and muxing data lines depending on address bits. Because we tri-state the data output bus when the block ram is not selected we should be able to use a single output for all block rams, but for now I assign a signal to each output and explicitly select the one we need. With the above, we should have 196Kbyte of total addressable RAM. However, there is a significant issue which needs attention before any code will run from these BRAMs. RPU currently expects data presented to it to be formatted into the expected data format. The memory interface does not have a byte enable or such like, as you would typically expect. So memory requests need swizzled for endianness and size prior to being given to RPU. This system will be getting a significant overhaul soon, which will change all of this so RPU is presented with simply a raw view of memory – but for now, we need to swizzle data from the BRAM before it enters the CPU. To do this, there are two additional processes, and the signals assigned by these processes are what is read from or written to the CPU interface. There is one more process associated with memory, and that handles the state machine for handling the requests from the CPU. It also will assign various I/O data. It simply maps addresses to signals. I think this process can be implemented better, but for ease of editing for tinkering it works well for now. At this point, you should be able to write your “chasing LED” program and have it as the BRAM initial contents, so when the Arty S7 board is flashed with the FPGA bitcode you will see the onboard LEDs flash. The code for this is just as simple as you’d expect. IO_ADDR_LEDS above is defined to be 0xf0009000, so the MEM_proc process you can see earlier picks up this memory write and redirects the lowest significant 4 bits to the external LED I/O pins. I previously mentioned that I’d build my own RISC-V toolchain using Windows Subsystem for Linux. I attempted to build the latest version of riscv-tools, however I kept running into build issues this time around. I instead have switched to using the GNU MCU Eclipse RISC-V Embedded GCC toolchain which is very handily released as a full windows binary package. It can be obtained from the github releases project page. A basic main() function with the above code is compiled with a linker script to place it at location 0x00000000 with no standard libraries or start files. The resulting elf binary is tiny, and you can use objdump with the -s argument to get part of a hex dump output which you can then transform into the .coe file required by the Xilinx block ram generator to use as the initial BRAM contents. The .coe file format is simple, and consists of two declarations – the radix of the data to follow, and a comma separated vector containing the data itself. I use this method to create the real bootstrap firmware which initializes and ends up copying code from SD card into the DDR3 ram for execution – but more on that in the next post! I was also able to use the new simulator in Vivado to check internal signals while some code ran. 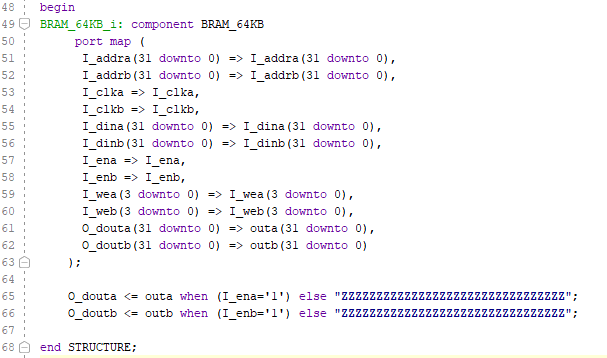 One thing that caught me out is that changing the .coe initial BRAM contents file and rebuilding the project will not bring the changes from that file into the new BRAM IP. 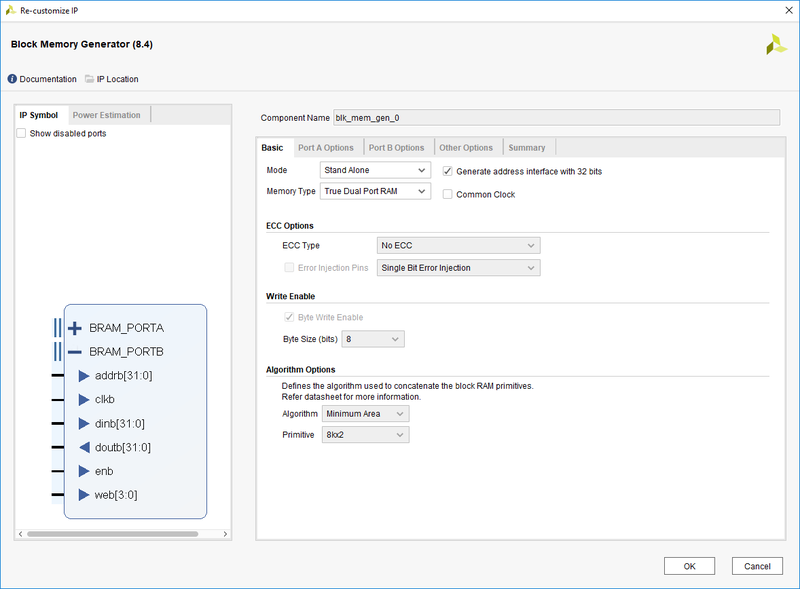 You need to right click the BRAM in the designer, select reset output products, and then generate them again for the updated .coe to be integrated. A rather annoying, slow and unnecessary step in my opinion – but maybe there is a reason for this that I do not understand as yet. Flashing LEDs are cool, but we have a character generator to port! My previous miniSpartan6 design ran HDMI out at 640×480, using a widely available USB powered HDMI panel targeted at Raspberry Pi use. With ArtyS7, I wanted more resolution, and have defaulted to outputting 720p60. The changes to allow this on the DVI-D side of things are minimal – pixel clock updated, and the VGA timing signals for 1280×720 at 60Hz are used. The pixel clock for 720p should be 74.25MHz, but the much-easier to obtain 75MHz will generally still work. The previous character generator (discussed in this blog post) works off of a 5x pixel clock – which in this case would be 375MHz. This is too high – the Spartan7 block rams of the Arty S7 are rated for around 350MHz – so we need to architect the character generator to run off of the raw pixel clock of 75MHz. This is actually fairly simple to do. The character generator works by feeding in an X and Y position of the current VGA timing location as it’s scanned out. If we offset the timing locations, by putting the various sync signals through an 8-deep FIFO, we can feed the character generator pixel values which are 8 pixels early – allowing the generator 8 cycles of latency in order to perform the necessary text and font lookups from BRAM. As the font glyphs are 8 pixels wide, we can prefetch the next glyph data. By the time the sync signals are at the end of the FIFO, the character generator will be providing the correct pixel colour values for the glyph row required. This provides a 160×45 text console display with 8×16 glyphs. To connect the FPGA dev board to an HDMI monitor, I took what I learned from my previous HDMI pmod post and made my first PCB using PCBWay. Then I soldered an surface mount HDMI connector and the PMOD 0.1″ angled header terminals. I may post a video of this in the future. I tinned the surface pads with a soldering iron and used a hot air gun with lots of flux to reflow the connector to the pads. I am using an Atrix Lapdock as my HDMI sink – it’s a laptop form factor with HDMI input for the screen, and a USB hub with integrated keyboard, trackpad and battery. Again, this is usually used to make raspberry pi laptops, as the Lapdock itself can provide 5v power to devices as well as powering the screen. So with this, I have a RISC-V Laptop! That is it for now – I intended to discuss the DDR3 memory in this post, but it just got too long. That post will follow shortly. I have put the RPU CPU Core HDL on Github, as well as the Arty SoC project. This code is in front of these blog posts and includes the DDR3 implementation, so if you are impatient you can go and look now. There are timing constraint violations introduced with the HDMI output and DDR3 IP implementation, but I have yet to look into them – and the built FPGA bitfile flashes to my board and runs at a lower speed. Thanks for reading! As always, I am available on twitter @domipheus for any queries. If you try out the SoC from github, let me know!